Bar chart (above) of emotions expressed by students attending U. S. universities. Click on chart to go to full graphic comparing all countries. 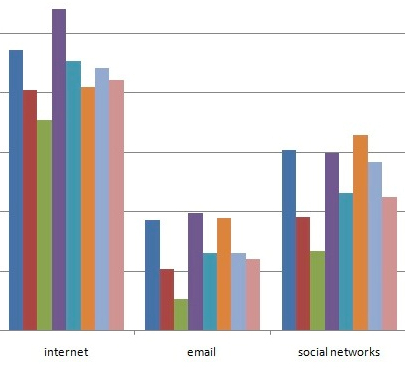 The most important connection is to friends & family: In their narrative accounts of their day without media, students wrote most about missing the on-demand back-and-forth exchanges with their friends. Going without media made them feel so alone. A surprising number of students also observed that they suddenly realized that their 24/7 use of media had masked how lonely as individuals they really were. Media technologies are defining students’ sense of self: Students have become their own avatars – their 24/7 use and consumption of media has shaped them into beings not entirely of their own design. Boredom: A failure of imagination: Again and again students from the US universities wrote of literally not knowing what to do with themselves without access to media. How could they relax? How could they entertain themselves during chores and exercise, for example? Language of dependency: US-based students used literally the same terms associated with drug and alcohol addictions to describe their reactions to going without media for 24 hours – as the ICMPA’s 24 Hours: Unplugged study in 2010 also documented. Students at US universities used words such as: Fretful, Confused, Anxious, Irritable, Insecure, Nervous, Restless, Crazy, Addicted, Panicked, Strong Compulsion to Use, Angry, Suffered Withdrawals, Itching, Dependent, Depressed, Jittery, Paranoid. They themselves made explicit connection to drug addictions. Symptoms of ‘withdrawal’: Students reported both mental and physical symptoms after they unplugged. Students had expected to be irritated and frustrated, but they were taken aback by the level of stress, anxiety and sheer misery they experienced. Perhaps most devastating, however, was that going without media exposed many students to the realization that they were essentially lonely individuals. To fail is human: Those students who reported failing often mentioned their utter inability to engage on a human level. Some reminisced about their carefree childhood days unplugged, but noted they couldn’t figure out how they could adapt to a media-free world today. Quite a few wondered how their parents’ generation managed their lives pre-cell phones and the Internet. Out of touch – with oneself: Students again and again reported that being forced to go without media made them aware of the extent of the relationship they had with the media they consume and the technologies they use. People are not a replacement for technology, they noted, but many observed that media technologies had come to define their sense of self.